Hey everyone! It is time for a The Cutting Cafe Project! This time we could use whatever files we wanted to and I used four different ones. The items I made are going into a gift bag that I made. I used the Gift Box with Divider, the Loopy Loopy Bow, the Bow Tie with a Slit, and the Bow with Ribbon Set. These are all easy to make even if you don’t have an electronic cutting file as they do come in PDF form so you can print and then hand cut. Be sure to stop by the Cutting Cafe Blog to see all of the design team projects. Leave a comment and you will be eligible to win three free files of your choice! For our design team posting this time for The Cutting Cafe, we could choose any file we wanted to use. I needed some little trinket holders for gifts so I used the Nugget Candy Box file. The original purpose is to hold four Hershey nuggets. But, I chose to use it for something else, thus showing the versatility of the files. The file comes with three top options. The first is a with a heart cut out. You can leave it open or use acetate to make a window. I chose to line the inside with black cardstock and add a foam heart sticker. The second is a rectangle cut out. Again, I lined the inside of the top with black cardstock. The third is a plain top, which I decorated with the heart cutouts from the heart top. Be sure to stop by The Cutting Cafe Blog on the 7th and 21st of each month as the design team posts go up on those days. Today’s will have lots of variety since everyone could choose whatever files they wanted to use. Be sure to leave a comment. When you do, you are entered into a random drawing to win three files of your choice on the next design team posting! We also love to read your comments! This week for our design team project for The Cutting Cafe, we were to use the Tissue Box Cover Template. I needed something elegant in white and gold to use in my office for Christmas as my decorations are white and gold. This fits the bill perfectly. I also used the Bow with Slit Template File to make the glitter bow. Be sure to stop by The Cutting Cafe Blog on the 7th and 21st of each month to see all the design team projects. Leave a comment and you just might win three files of your choice! This past Saturday I did my first craft fair. It went fairly well. I wish there had been more traffic, and my tablecloth is wrinkled, but for the first time, I am ok with it. I am back with another design team project for The Cutting Cafe. For this posting, we were able to use any file we wanted to. I chose two to work with, the Birthday Word Gift Card Holder and the Birthday Number Candle Set. First, one of my staff is turning 65. I needed a card large enough for everyone in my department to sign, so I made a scalloped card base that is 9″x7″. I added an embossed panel and holographic gold dot stickers, but wanted the focal point to be the Birthday Number Candles! Next, I will be giving her a gift card so I wanted something separate for that. I kept the theme the same with the tone on tone white shimmer paper with gold. I used gold Dazzle stickers to add accents. 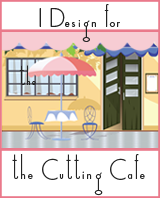 Be sure to visit The Cutting Cafe’s Blog on the 7th and 21st of each month as that is when the design team postings go up. Make sure to leave a comment as on the next posting a name is randomly drawn from the last posting’s comment and that person wins three files of their choice!